What do you do when justice isn't being served? In real life, you probably moan and complain and maybe write a letter or go on TV to have your voice heard. In the movies, individuals turn to vigilante justice and in the case of John Doe: Vigilante, that justice takes on a very large and bright spotlight. Jamie Bamber, best known for his TV work in "Battle Star Galactica" and "Law & Order: UK" stars as the titular John Doe, a guy who decides to take justice into his own hands. The thriller suffers from a case of bad poster but the movie itself is far better than the terrible artwork suggests and while we'll have more on that later in the week, we wan to give you the chance to see the movie for yourself. We've got a couple of copies of John Doe: Vigilante to give away and entering is easy: simply email us the name of the movie's director. Contest is open to everyone though please note that the DVD's are Region 1. Contest will be open until midnight PST on Sunday, April 12 with winners randomly selected from all of the correct entries. 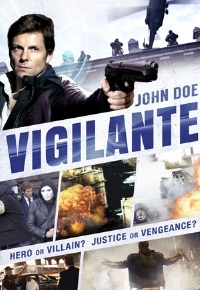 John Doe: Vigilante is available on DVD on Tuesday, April 14.